To Samnanger on the "Ships starting with S" page. All these pictures were received from Arne Tvedt, Norway. Dimensions: 380' x 49' x 30'. Machinery: Triple exp. 1500 ihp, 10.5 knots. Delivered in Aug.-1918 from Canadian Vickers Ltd., Montreal (Shipping Controller, managed by Furness Withy & Co. until 1920). Sept. 30 Sydney, C.B. Clyde Oct. 15 HX 77 Convoy will be added. Nov. 11 Hartlepool Hartlepool Nov. 12  Put back after collision. Nov. 29 Oban   OB 251 For Pepel. Dispersed 17 20W, Dec. 1. Based on an article in "Krigsseileren", issue No. 1, 1986 - Keep in mind that some of these personal stories can sometimes have incorrect information in them, as they are often written many years after the fact. Please compare with the info found in the archive document and in A. Hague's Voyage Record above. 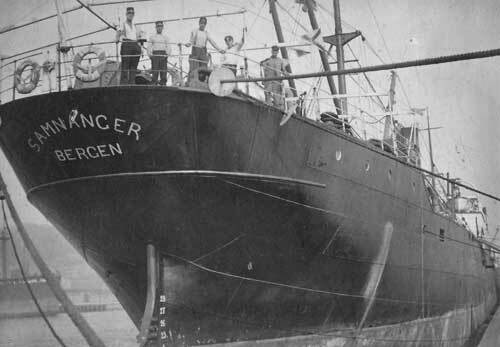 Samnanger departed Bergen on March 3-1940 for Buenos Aires to take on board a cargo of grain for Norway. She was without ballast and when she encountered a horrendous storm in the North Sea she very nearly ran aground. After a couple of weeks they bunkered in St. John, N. B. before heading to Norfolk where a cargo was loaded for Rio de Janeiro, and en route they heard the news about the German invasion of Norway (Apr. 9-1940). They all agreed to continue to their destination, but were met by the British cruiser Norfolk, which placed a prize crew on board and set course for Freetown, Sierra Leone, where they wanted to place her under the British flag, but in the end she continued to Rio under the Norwegian flag. From Rio she went to Rosario and La Plata for a cargo of wheat, then back to Freetown. While waiting for a convoy the majority of the crew came down with malaria. It took them 3 weeks to get to Liverpool. Note that she's listed, together with Borgland, Elg, Jamaica and Tigre, in Convoy SL 39, departing Freetown on July 9-1940, arriving Liverpool on the 29th. The author of this article says Captain Hansen barely slept; when he wasn't taking care of his duties he was taking care of his sick crew, even after arrival Liverpool, because the hospitals were full. They were in Birkenhead where they endured numerous air attacks and had many a close call, with bombs falling near the ship. (It looks like she remained in Liverpool for about a month - again, see the archive document). She later continued to New Foundland and loaded props in Woodstock - she's listed among the ships in Convoy OB 207, which left Liverpool on Sept. 1-1940 and dispersed on the 6th, Samnanger arriving St. John's, N.F. on Sept. 13, Woodstock on the 16th. Danio, Hild, Snefjeld and Thyra are also included in this convoy - ref. link provided in the Voyage Record. Samnanger now headed to Corner Brook and Sydney, C.B., where she joined Convoy HX 77 back to the U.K. This convoy is not yet available among the HX convoys included in my Convoys section, but will be added - see ships in all HX convoys. It originated in Halifax on Sept. 30-1940 and arrived Liverpool Oct. 15, but as already indicated, Samnanger joined from Sydney, C.B. ; she stopped at Clyde on Oct. 15 (Brandanger and Davanger were sunk - follow the links for details; Dagrun, Emma Bakke and Heina also took part). The author of the "Krigsseileren" article claims that they had a converted passenger vessel as one of the escorts(? ), but a few days off the coast of Scotland this ship was sunk. He says there were explosions and fire all around them that night, and several ships went down. The captain gave the orders to turn around, and they headed in the opposite direction until the next day, before turning back towards the U.K. again, going through debris and bodies all day long. A few days later they arrived Methil where they found out that only 5-6 ships of the convoy had made it to their destination (this is a bit exagerated - see the external link at the end of this page). Samnanger then went to Hartlepool where about half of the crew paid off and were replaced by new men. The following month, she was on a voyage from Hartlepool to Pepel, Sierra Leone in ballast and was meant to follow a convoy as far as 15° W before heading south on her own, but lost the convoy on Nov. 29, and nothing further was heard from her. At the 2nd external website that I've linked to at the end of this page, she's mentioned in Convoy OB 249, which left Liverpool on Nov. 24, but she probably did not join, or returned to port, because she shows up again in Convoy OB 251, originating in Liverpool on the 28th, dispersed on Dec. 1. Her destination is indeed given as Pepel. Follow the link provided in the Voyage Record for the names of other ships taking part in this convoy, the Norwegian Fernlane is also listed. Samnanger had started out from Oban on Nov. 29, according to the archive document (it'll be noticed that the departure date Nov. 25 is also given here, but it looks like it has been erased). In the evening of Dec. 2-1940, she was torpedoed amidships, then shelled (by 50 rounds) by U-99 (Kretschmer), in approx. 53 51N 18 15W. She was on fire for several hours, then capsized and sank in the early morning hours of Dec. 3. There were no survivors. For info, U-99 was also responsible for the attacks on Strinda, Lotos and Snefjeld earlier that year, and Beduin and Ferm the following year. Roger W. Jordan states that Samnanger was sunk by U-99 in 08 26N 16 50W on Dec. 21, so there's quite a difference in the date (and location) here. (This date may have been the date all hope of her showing up at her destination was finally given up?). The position is the location in which the Admiralty assumed the ship had gone down, later shown to be wrong (R. W. Jordan has probably based his info on this initial assumption). Jürgen Rohwer also mentions this erroneous report in a footnote regarding Samnanger, saying the following: "In B.R. 1337 the Samnanger is reported lost on 21/12/40 in 08 26N/16 50W together with the Charles Pratt, but U-65/Stockhausen, which sank this tanker, attacked only one ship. 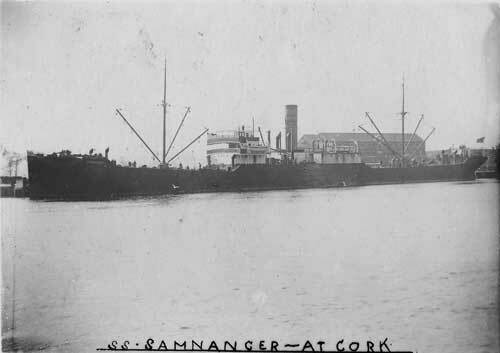 U 99 identified the ship as the Samnanger". B.R. 1337 refers to "British and Foreign Merchant Vessels Lost or Damaged by Enemy Action During the Second World War. From 3rd September 1939, to 2nd September 1945". Rohwer does not mention a convoy in connection with Samnanger. OB / OA / OG convoys - OB 249 and OB 251 are included, and as will be seen, Samnanger is mentioned. Stavern Memorial commemorations - There's also a Captain Sigurd Jamne named here. This is an error - in fact, he was the captain of Sandanger, and the memorial also has him among the casualties there. U-99 | Otto Kretschmer | Uboat.net also has an account on the attack on Samnanger. Back to Samnanger on the "Ships starting with S" page. Other ships by this name: Norway had previously had another Samnanger. This was originally the Den of Airlie (Dundee), built in Glasgow 1895, 3520 gt - whale factory. 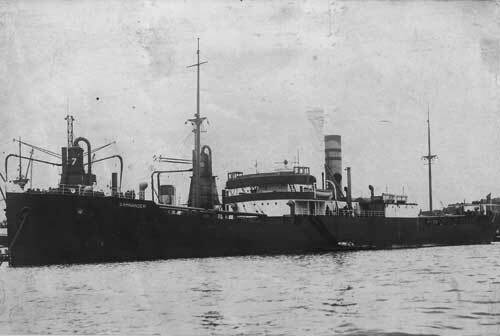 Named Vasca da Gama 1911-1915 (Chr. Nielsen & Co., Larvik), then Samnanger 1915-1916 (H. Westfal-Larsen, Bergen), Bestum in 1916-1917 (K. Th. Einersen, Kristiania). Sunk by shelling from a German U-boat on Aug. 12-1917, voyage Baltimore-London with flour and grain. ("Damp - Dampskipets æra i Vestfold"). In Dec.-1963 a tanker named Samnanger was delivered to Westfal-Larsen from Burmeister & Wain, Copenhagen. Became Herborg for Vaboens Rederi A/S Kristiansand in 1973, Balder Borg (K/S A/S Balder Tank - P. Augustsson, Kristiansand) 1976, Thracian Shirley of Monrovia 1979, Balder Borg again in 1981 (same owner as in 1976), then Panamanian Thracian Shirley in 1982. (Westfal-Larsen fleet list). The text on this page was compiled with the help of: "Nortraships flåte", J. R. Hegland, "Sjøforklaringer fra 2. verdenskrig", Norwegian Maritime Museum, Volume II, and misc. others as named within the text above - (ref. My sources).